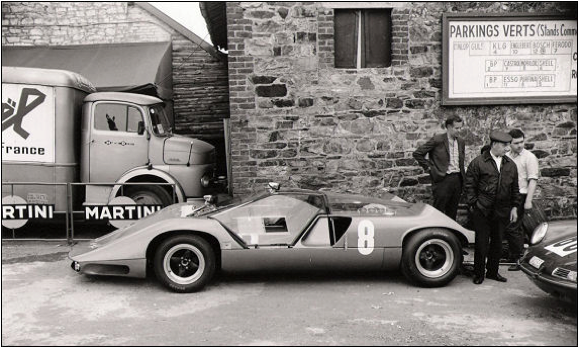 In 1968 the Adams brothers were commissioned to build a mid-engined, pure sports racing car for sister company Marcos Racing, with a view to competing in group six 3 litre GT racing and the Le Mans 24 hours. The design was typically Adams, with stunning angular lines utilising time proven Marcos engineering in the wooden chassis, fibreglass and masses of perspex. 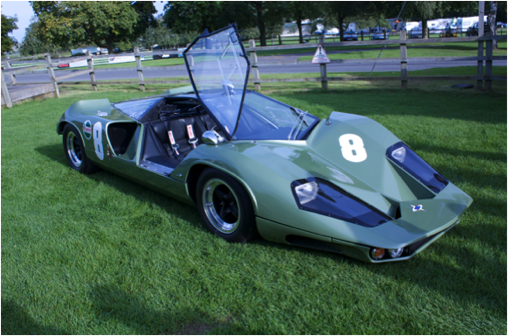 The construction included side mounted fuel tanks and radiators, the usual Marcos deep sills, and semi gullwing doors and a huge perspex engine cover. 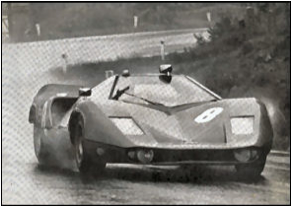 The car was initially powered by a 3 Litre Repco Brabham Formula One engine, and fitted with state of the art fully independent suspension. 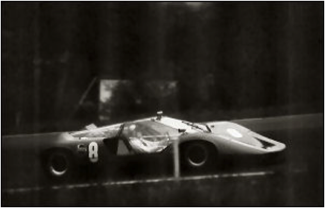 After testing at Castle Combe and Silverstone the car was entered for the 1000 kilometer race at Spa-Francorchamps on the 26th May 1968, with drivers Eddie Nelson and Robin Widows, the latter withdrawing before the start which allowed Jem to take the drive. 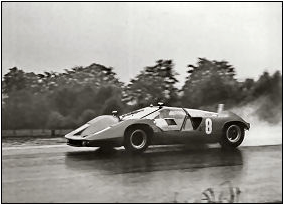 The weather conditions at Spa were horrendous and the car only completed 17 of the 71 laps withdrawing with electrical problems due to the water. The conditions were so bad that water was getting into the cockpit and flooding the car, it was brought into the pits and holes were drilled in the floor to allow the water out, it then succumbed to water in the alternator and retired a few laps later. Unfortunately this was the car's first and last outing. The car was entered for Le Mans that year but unfortunately the FIA decided to postpone the 24 hour race until late September due to student riots in Paris. The car was returned to the UK and the Repco engine was removed and replaced with a Buick V8, Jem then used the car on the road. Problems arose with the tax man ( the details are sketchy ), resulting in the rapid relocation of the car to the United States. The car turned up in California where it was road registered in 1971 and still resides in America to this day. It has been in the Morris family for the past 40 years, and has been painstakingly restored to its former glory. 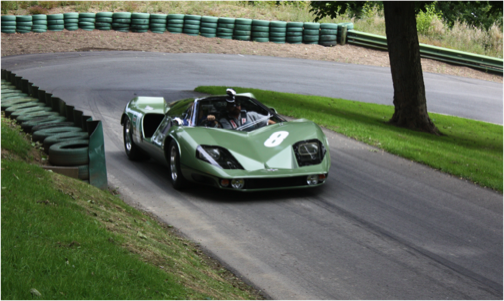 August 2009 saw the 50th Anniversary of Marcos at the Prescott Hill Climb Ciruit, which was to be the largest gathering of Marcos cars ever assembled. The car was flown in from California by the Morris family especially for the event, with the help of Marcos Heritage and donations from Marcos owners and enthusiasts. This is the first time the car had been in the UK since 1969. The XP generated an enormous amount of interest, especially when it powered up the hill bringing back many nostalgic memories for its makers, enthusiasts and hundreds of onlookers alike. The following summer saw the XP back on British soil in 2010 when the Morris family received an invitation from Lord March to bring the car over for the Goodwood Festival of Speed. The car ran the Goodwood hill on all three days and Ned got his time down to an impressive 64 seconds over the entire 1.16 mile course.